Anna attended St. Theresa of Avila school from pre-kindergarten through grade 6. Anna loved everything about the school and was involved in everything the school offered. Anna was a great student. She acted in the school plays, sang in the choir, was a member of student council and the list goes on and on. 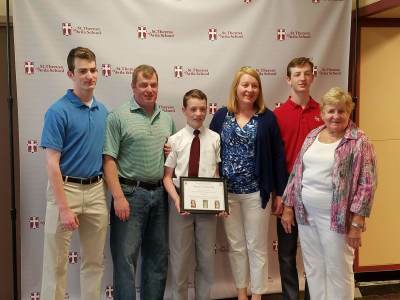 To honor Anna's memory, the Jerome Family, along with the faculty, staff and St. Theresa Community have implemented a scholarship for a fifth grade student meeting a pre-set criteria. This student must exemplify good character as well as a love for the school. Ryan Conneely was the recipient of the 2018 award. Anna attended Boston Latin School after leaving St. Theresa's. Once acclimated, she loved everything about that school as well. She was an honor roll student, paricipated in clubs and ran track. Anna was passionate about track and made varsity while in the 7th grade. To honor Anna, the Jerome family has also implemented a scholarship for 2 seniors - girls from the Parkway area that run track and also exemplify Anna's good character. Katelyn Pease and Myanelle Ogara were the recipients of the 2018 award.